Channel 4 recently showed a disturbing documentary about the fighting culture that flourishes among some Irish Travellers. The programme was built around a ferociously aggressive man who appeared to judge his place in life and that of other men, by his prowess at bare-knuckle fighting. If illiterate men want to indulge in consensual mayhem, then I suppose that is their business (although I imagine the law might have a view on how valid that consent might be - Operation Spanner anyone?) What truly disturbed me was the systematic coarsening and brutalising of boys, some under five years old, by their being inducted into the fight culture and made to participate in catching killing and butchering wild animals. Any kind of pity or sensitivity was treated as weakness, and the scenes in the film showed real child abuse. 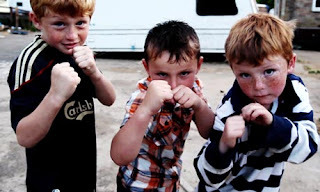 Once those lads grow up they are almost certain to be as vicious and illiterate as their fathers. That's a gloomy prospect both for them and for society.